A balmy evening along the waterfront in the city of Victoria on Vancouver Island, British Columbia, Canada. 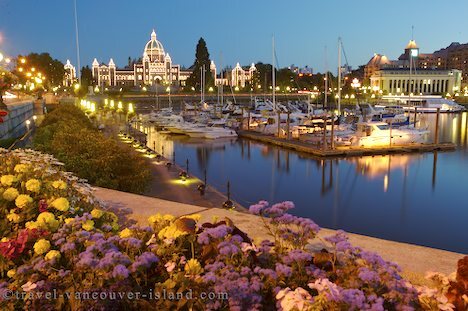 The city of Victoria is situated on the south eastern end of Vancouver Island in British Columbia, Canada, and has a delightful and vibrant waterfront. During the balmy summer evenings, the Victoria is abuzz with tourists strolling along the waterfront enjoying the atmosphere and sights. The Legislative Buildings are a prominent feature with bright lights tracing the outlines of the structures which were designed and built in the 1890's. An assortment of pleasure boats bob gently on the protected waters of the harbour as the waterfront lights begin to glow softly as night falls. The sound of horse hooves resonate through the air as a horse drawn buggy passes by on the road near the flower filled waterfront walkway of Victoria. The city of Victoria is the southern most access point to Vancouver Island in British Columbia, Canada. Photo of the evening lights of the waterfront in downtown Victoria on Vancouver Island, British Columbia, Canada.